BINTULU, SARAWAK: One individual is confirmed dead after an oil tanker exploded at a traffic light near Bintulu Medical Center on Jalan Kidurong here Monday. It's reported that firefighters removed the charred remains of the victim in the scene. The deceased had not yet been identified. 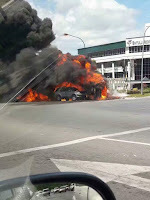 Bintulu firefighters who showed up in the scene at noon on Monday required over an hour or so extinguish the flames. Initial reports indicate the as much as five vehicles were active in the 11.55am incident. It's understood that a number of individuals in other vehicles were able to escape the flames.